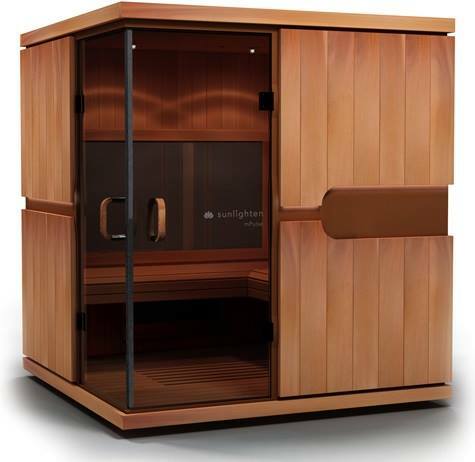 Infrared Sauna is a type of Sauna that emits sun-like rays to heat the body from inside out. 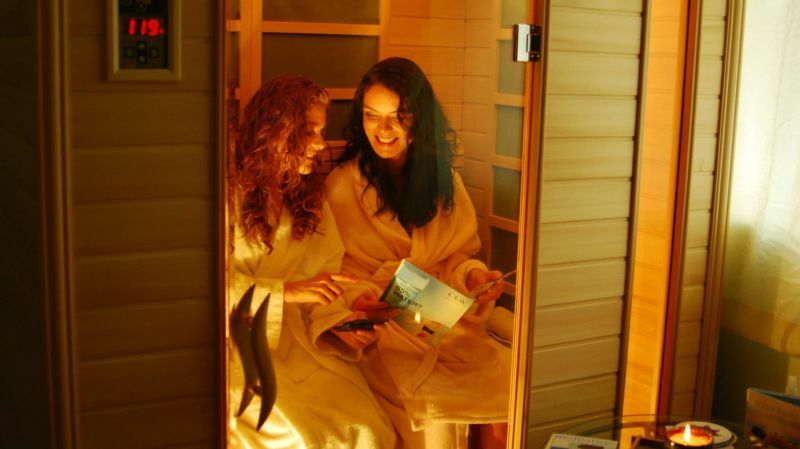 What is the difference between an infrared sauna and any other sauna? Traditional saunas are basically a room with a heater. They are heated by wood burning, a gas stove, hot rocks from a fire, an electric coil or a gas heater. These saunas operate at high temperatures but only heat the surface of the body, mainly by convection. They were originally designed for drug and alcohol detoxification. Far infrared heaters, on the other hand, are heated by metallic or ceramic elements that emit a narrow spectrum of mainly far infrared energy. They were introduced in the early 1980’s and use radiant energy that heats the body from the inside as well as the surface. Research shows that the infrared can penetrate about 3.5 – 4cm into the body and for this reason they get great results at much lower temperatures. Not only is the cooler temperature more comfortable for people, but far infrared also cleanses the tissues more effectively. The heat is not just effective for bacteria die-off (by creating an artificial fever), but has a whole host of other detoxification effects, as it allows the skin to detoxify toxins, including heavy metals, more effectively, essentially taking pressure off the internal detoxification organs. In many infrared saunas, there is the option to turn on the colour therapy, which is an ancient and often highly effective healing modality. Different spectrum of light provide different healing qualities, including nourishment of vital organs, emotional release and the movement of chi/vital energy from the head down the body, where we are often deficient, to improve healing capacity. 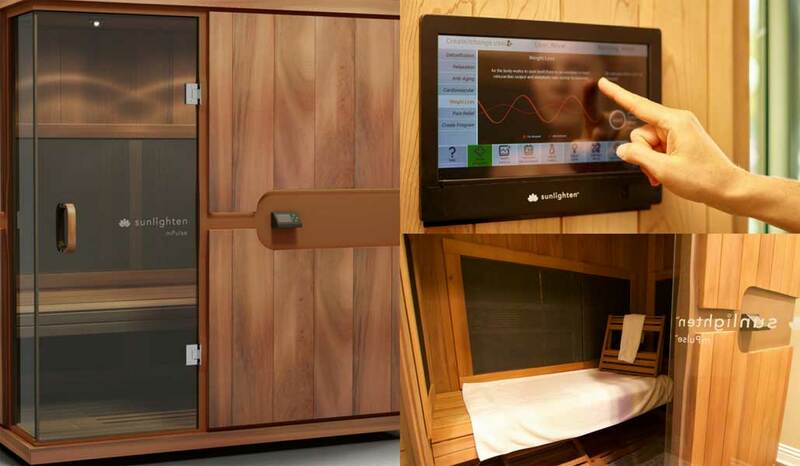 How does an infrared Sauna help your health? · Balances the autonomic nervous system to enhance parasympathetic activity (rest and digest), which is essential for healing. How do I prepare for a sauna session? Please note that you are detoxing even as the infrared sauna is heating up – you don’t need to have the infrared sauna at the maximum heat to get the full benefit. Remember the heat is NOT as hot as an air sauna, but the benefits are believed to be as good, if not greater. What do I do during a sauna? 1. Ideally, move around every few minutes so different parts of your body are directly exposed to the infrared and colour panels. 2. Especially keep your hands open as much as possible as many of the acupuncture and reflex points are on the palms of the hands. 3. If you feel light headed or dizzy, or your body releases odours that are unpleasant, open the door slightly or sit outside until it passes. 4. Relax and focus on your breathing at all times. The sauna is a great place to meditate and do visualisations. 5. Keep sipping your water throughout the session to remain hydrated. These are all for precautions(safety of yourself and others) and optimal results for your float experience. If you have any questions or concerns before you float, please call us to discuss. How will I know when the session is over? Your float session is over(5 minutes before the session ends) when you hear the second music coming on – the first one is for 10 minutes at the beginning to help you to relax in the tank. You can also bring along the music that you want to hear in the tank (MP3). Do I need to wear bathers? No. You do not need to wear bathers, or we recommend you not to wear them as they uncomfortably stick to your skin in the water(which is not ideal for the purpose of sensory deprivation therapy). You will be taken to a private room, so there is no need to worry about privacy! Most people who have a concern about their claustrophobic fear feel relaxed once we take them to a float room and they see how spacious the tank is. If you are still uncomfortable or worried in the closed tank, you do not have to close the lid or leave it half open. You are always in control of your environment and get out at any time. We provide you towels, body wash/shampoo, earplugs, and robes(for massage afterwards). Basically, all you need to float is yourself! However, you may want to bring your own comb/moisturiser/makeup kit if you need to look nicer afterwards. Under which conditions should I not use Infrared Sauna? You should not use the sauna if you have any known medical condition that is exacerbated by dehydration, overheating, or electrolyte depletion; or are currently on any medication that affects blood circulation. If you any medical concerns about using sauna, always consult your doctor – particularly, a doctor experienced with sauna therapy – before using one. How hot does the Sauna get? The recommended temperature range for infrared sauna sessions is 120-150 Fahrenheit degrees (approximately 45 – 70 Celsius) . Infrared heat is a different type of heat than traditional wet or dry saunas, so while you do sweat you don’t feel as hot as you might in a traditional sauna. If you have concerns about getting too hot, start out at the low end – 120 Fahrenheit degrees – and adjust upwards from there based on your comfort level. You have full control over the temperature while you’re in the sauna. Is it safe to use if I have heavy toxification? 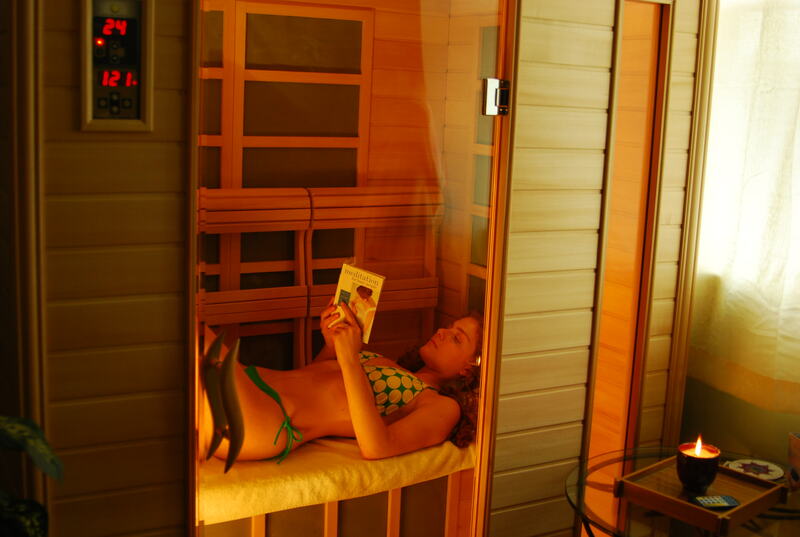 Infrared Sauna therapy is an outstanding treatment option for detoxifying the body. Please be aware, though, that we do not have a doctor on staff and we do not provide medical consultation for you while using our infrared sauna. If you have concerns about the interaction of infrared heat with any level of known toxicity that you aware of, or are otherwise working on a chronic health issue, we recommend only using our sauna under the guidance of a doctor. What do I do while I’m in there? You can do nothing. We love nothing here at Soul Space. We don’t do nothing often enough in our culture. Read while you’re in there; the air itself isn’t humid, so books won’t get wet and messed up. Your hands may get sweaty, though, so maybe turn pages carefully. Listen to music, podcasts or audio books; our sauna has an audio system that you can connect your phone or other media device to, either through a wired connection or via Bluetooth, so you can control the audio from inside the sauna. Because you will get a spacious sauna room, it will be beneficial if you can do some stretching or moving to release your muscle. Can children use Infrared Sauna? Children, particularly before puberty, don’t have the same ability to regulate their body temperature, so there’s definitely some watch-outs for younger kids with any kind of sauna as they are more at risk of heat exhaustion or heat stroke. We don’t allow children under 8 to use our sauna. Children between 8 and 15 can use it with a parent sitting in the room with them (not in the sauna, necessarily; but in the room). And young adults between ages 15 and 18 can use the sauna with a parent available in the building at all times. We require the first 1-2 sessions for a minor to be limited to 15 minutes, just to see how their bodies react. If they can handle 15 minutes without any apparent negative effects of overheating, they can extend further sessions to 30 minutes. We do not allow sessions longer than 30 minutes for minors. As always, remind your child about the importance of thorough hydration after use of a sauna.